Front Row, Left to Right: Charles D. Frazier, Rock Region METRO Executive Director; James King; Jannetta Brown; Keith James, Diane Pride and David Fowler. Second Row, Left to Right: Mohamed Keita, Courtney Brooks, Deric Williams, Charles Dolphus, Robert Keathley and Carl Beecham. Rock Region METRO hosted its first-ever New Ambassadors Graduation Ceremony Wednesday, Sept. 19 to celebrate training certifications for eight operators and a trainee mechanic. The graduation ceremony featured an overview of the training program, a message outlining the partnership between METRO and Amalgamated Transit Union Local 704, remarks from Frazier and a keynote message from Dr. Margaret Ellibee, chancellor of the University of Arkansas Pulaski Technical College, who thrilled graduates with her story of early teaching days in rural Arkansas and the stick-shift, school bus-driving duties that came with the job. 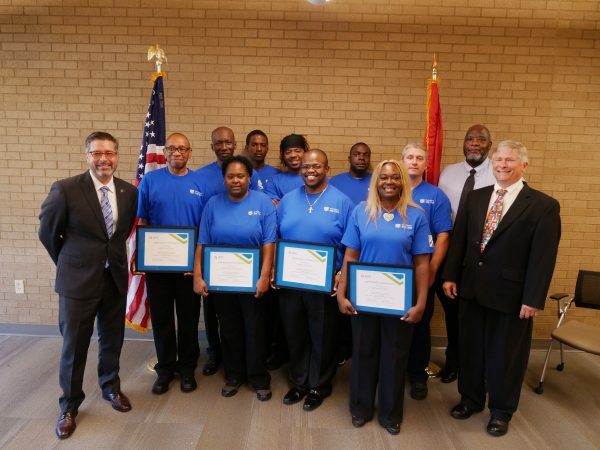 Graduates included Courtney Brooks, Jannetta Brown, Charles Dolphus, Keith James, James King, and Diane Pride, fixed route operators; Mohamed Keita, paratransit operator; Robert Keathley, streetcar operator; and Deric Williams, third year trainee mechanic. Guests included METRO board members, executive and administrative staff and family and friends. “METRO hires roughly 45 employees on average each year. Sixty percent of METRO operators have a tenure of 5 or more years on the job. As our industry faces increasingly stiff competition for qualified workers, it is critical to celebrate the successes of our employees and make sure they have a path for achieving their goals,” said Frazier. The METRO team expects to host three graduation ceremonies each year to welcome new operators and mechanics to the agency.